IELTS sentence completion questions are very common in IELTS reading. This practice is to help you understand about the importance of paraphrasing. You need to learn which words can and cannot be paraphrased. Read the passage below and then answer the questions. Penguins are one of about 40 species of flightless birds, a category that also includes the ostrich, emu and kiwi. Penguins are neither the smallest nor the largest of the lot, but some may think of them as the most interesting. These waddling birds are known for their white bellies and dark-colored backs and wings, resembling a tuxedo. This distinct coloring is thought to hide penguins from predators in the sea. Besides its coloring, a penguin’s body is designed for swimming, and includes tapering at both ends of the body for hydrodynamics, paddle-like wings and web-shaped feet. 1. The ostrich, emu, kiwi and penguin are from the same group of ……….… birds. 2. Penguins can conceal themselves from predators with their ……………………..
Click to reveal the answers. Passage take from – here. To learn more about the recommended length for your writing task 1 and task 2 essays, check the sample writing below. A free video lesson on an IELTS writing task 1 bar chart. Below is a band score 9 sample answer for an IELTS bar chart in writing task 1. Below the model is a link to a video lesson about how to describe an IELTS bar chart. Watch the video to learn essential tips for each paragraph for a high score bar chart. 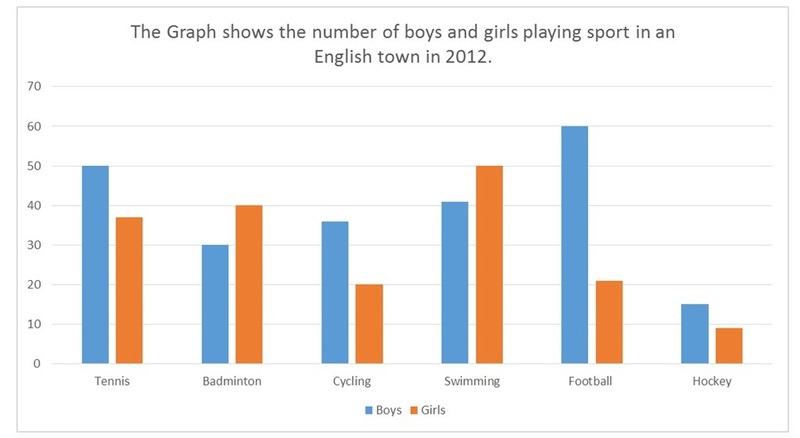 The bar chart illustrates how many children, divided by gender, played six kinds of sports (tennis, badminton, cycling, swimming, football and hockey) in a town in England in 2012. Overall, the number of boys playing sport exceeded that of girls in the given period and the sport with the most significant difference between the genders was football. Football was also the most popular sport for boys while the majority of girls preferred swimming. Furthermore, both males and females least preferred playing hockey. There were four sports in which boys participated more than girls. While 60 boys played football, the number of girls playing that sport was considerably lower (around 20). With regards to tennis, the figure for boys who played that sport was 50 as opposed to just under 40 for girls. Similarly, more boys cycled than girls (approximately 35and 20 respectively). The difference, in terms of hockey, was minimal with only about 5 more boys playing that sport than girls. On the other hand, more girls took part in the two remaining sports which both showed a difference of about 10 between the genders. As many as 50 girls preferred swimming in comparison to 40 girls for badminton. The topic below was just reported in the IELTS academic writing task 2 last week. Take a look at the topic and see some ideas and vocabulary below to help you. Some people think that the government should spend more money on public service rather than wasting money on the arts. To what extent do you agree. Body Paragraph 1: Art is important because all societies need to express their culture through art. Body Paragraph 2: The arts are often poorly funded and therefore if money were directed away from the arts for any reason, even for public services, it would likely fail entirely. Conclusion: restate your opinion and summarise main points. Body Paragraph 1: Health care system – give reasons why this needs more funding. Body Paragraph 2: Public transport – give reasons why this should be improved. Body Paragraph 3: Explain that the arts are still important and why money should not be diverted away. Conclusion – restate your opinion and summarise main points. Steve, thanks for letting us know about the topic. Good luck with your results! Below are the answers to the Matching Paragraph Information – Hobbies for the Elderly – which I posted yesterday. Before you check the answers, here are some words to help you with the reading lesson. New methods of communication is a paraphrase for the information contained in the last sentence of section C.
Socialise means ‘to meet and be with people’. This is a paraphrase for the last sentence of section B. All reading exercises on ieltsliz.com have been written by myself to help you prepare for your IELTS test for free.